Sainsbury’s has launched Cook Britain, a beautiful new cookbook to commemorate a momentous year for Britain. With the Queen’s Diamond Jubilee and London 2012 Olympic and Paralympic Games just around the corner, British cooking is experiencing an exciting revival. The hardback, available in-store and online now is packed with 124 delicious recipes, bringing together the nation’s most popular dishes. With so much to celebrate this year, there are mouthwatering recipes for street parties, afternoon tea and picnics galore. Cook Britain pays tribute to unforgettable dishes such as Fish and Chips, Sausage and Mash and Jam Roly-Poly. Recent additions to the British dining table are also included, such as Spaghetti Bolognese, Chicken Tikka Masala and Pavlova. These family favourites reflect how modern Brits embrace flavours from around the world in their everyday cooking. Nostalgic photography and innovative design piece together the intriguing stories and vibrant history behind the country’s favourite culinary traditions. The regional section of the collection leads budding chefs on a gastronomic journey around the UK to rediscover old favourites and explore new recipes. Easy-to-follow recipes for starters, mains and irresistible puddings are guaranteed to expand every keen cook’s repertoire, whether cooking for the family or entertaining friends. Developed by the expert in-house team at Seven, each recipe has been tried and tested by Sainsbury’s to ensure great results every time. 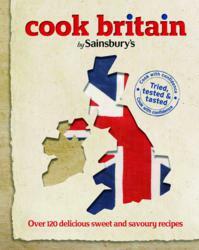 Cook Britain is a joint enterprise between Sainsbury’s and Seven, the award-winning strategic content agency. It follows the success of the Summer Recipe Collection, Baking Recipe Collection, Cocktails by Sainsbury’s and Winter Recipe Collection by Sainsbury’s. The latter was the first recipe book published by the supermarket and became the bestselling non-celebrity cookbook in the run-up to Christmas 2010. Seven is an award-winning, multi-channel content marketing agency. Clients of Seven include Virgin, Sainsbury’s, CIMA, Grant Thornton, Guardian Media Group, Lloyds Banking Group, New Look and English Heritage. For further information, find us at http://www.seven.co.uk or contact Shareena Ali, PR, Shareena.ali(at)seven(dot)co(dot)uk 020 7775 5549.